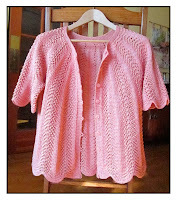 Recently, I completed a lacy little jacket with garter stitch front bands. The pattern called for garter stitch bands knit "as you go." 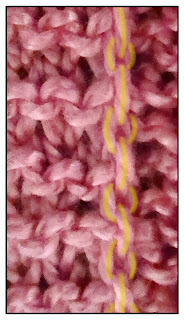 In past posts, TECHknitting blog has offered two cures for this problem: zig-zag bands and facings. Both of these solutions really do cure flip. Yet, neither of these cures quite suited the style of the little lacy sweater. There was significant shaping alongside the front bands, so the zig-zag method would not have worked, and a facing would have been too bulky for the style of the garment. What to do? Combining a couple of TECH-tricks resulted in a pretty good 2-part cure. It's not perfect: serious blocking was also required, and even now a very slight tendency to flip remains. Yet the situation has been so substantially improved that the jacket can be worn open, as shown in the photo above. The first part of the cure involved advance planning. As the garment was knit, the garter stitch border was lengthened to match the abutting stockinette fabric. The second part involved the finishing process--adding a column of stitches with a crochet hook all along the flip-hinge column, thus strengthening and neutralizing the fabric along this line. The blocking followed. Why lengthen the garter stitch border? Do you wonder why lengthening a garter stitch band would combat flip? Garter stitch is actually shorter, row for row, than stockinette. In stockinette, the stitches lay smooth and long but in garter stitch the stitches are diverted into the thickness of the fabric. In other words, any one knitted stitch can either be thick or it can be long. Because the stitches in a garter stitch fabric are busy being thicker, they end up shorter. When a short fabric is knit row-for-row alongside a longer one, the shorter one (the garter stitch border) pulls the longer one (the adjoining stockinette fabric) into a sort of a crescent. This stress is one (but not the only!) cause of band flipping. By lengthening the garter stitch band of the little lacy jacket, this particular stress was removed, so there was less tension to cause flipping in the first place. For further information about short rows, here are two posts: the first post covers the theory of short rows while the second post covers several different ways to make short rows. The kind used on this project are called "wrap and lift," the third kind covered in the how-to post (scroll).The "wraps" were formed around the first stitch of the stockinette of the jacket front, NOT the last stitch of the garter fabric of the band. In other words, the the band was always knitted full width. Sometimes, especially in a loosely knit work, merely lengthening the garter stitch band is so successful, that nothing more remains to be done to prevent flipping other than a serious blocking. However, I was pretty sure that with this cotton jacket, more was required, so it was on to the second step--the stabilizing column of stitches. This step was done with a crochet hook and a length of running yarn. It is essentially a trick of crocheting a column of slip stitches onto the column where the flipping wants to take place. Specifically, the last column of the garter stitch front band where it meets the stockinette fabric of the garment is the column acting as the flip hinge. If you poke at this column, you will discover this hinge column is actually a mini-tube. This mini-tube in the fabric arises because the garter stitch is thick, but the stockinette is not. Where a thick fabric meets a thinner one, the ladder from each row of yarn must be "drawn in" from the thicker to the thinner. Because these ladders are being drawn in from the two opposite faces of the garter stitch fabric, one after another, they form this mini-tube. The ladders of the mini-tube are illustrated in green below. If you have a sample handy, you might like to poke a crochet hook into this tube and see for yourself. Your set-up should look like the illustration below. Once the crochet hook has been inserted into the ladders of mini-tube, the running yarn is drawn through the tube in a series of crocheted chain stitches, working down the tube, ladder by ladder. If this makes no sense to you, no worries: step-by-step illustrated instructions follow. The work is turned so that the INSIDE of the band is facing you, which means that the stockinette fabric facing you will be the PURLED face--the REVERSE stockinette on the inside of the garment. As a result of turning, the blue garter fabric formerly illustrated on the right is now on the left. The crochet hook catches a loop in the running yarn, illustrated in gold in the picture below. This loop is drawn downward THROUGH mini-tube, below the ladder in green marked "1." Next, the crochet hook is pushed UP in the air on the OUTSIDE of the mini tube, so that it now passes in FRONT of ladder 1, with the golden loop remaining parked around its barrel. 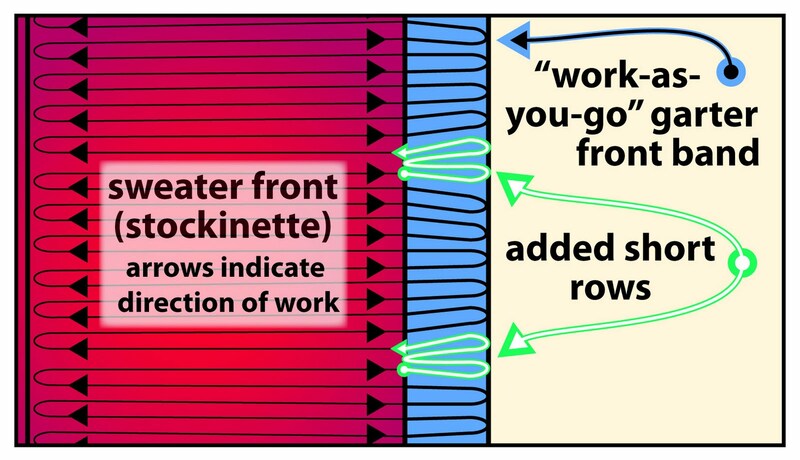 In other words, the loop is parked around the hook barrel and therefore is forced to remain stuck in position below ladder 1, as shown, while the hook itself is free to rise up on the outside of the mini-tube, above ladder 1. Finally, the crochet hook again catches the running yarn. The crochet hook is next pulled downward, taking the running yarn with it in a new loop. The hook with its running yarn will pass in FRONT of ladder 1, and will pass through the first golden loop made, and will then be pulled BELOW the ladder marked "2." 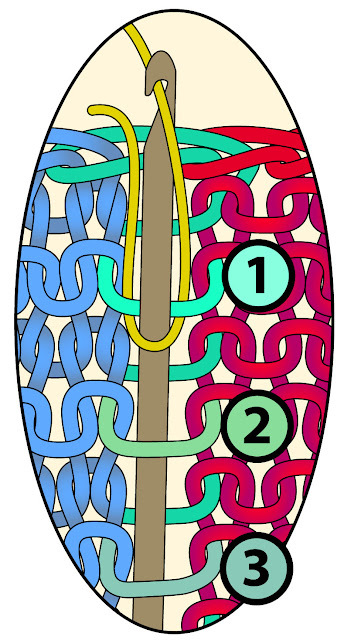 This second loop is again left parked around the barrel of the crochet hook just as the first loop was, while the hook is again pushed UP in the air on the OUTSIDE of the mini tube, so that it now passes in front of ladder 2. Again, the crochet hook catches the running yarn, as illustrated. These steps are then repeated. 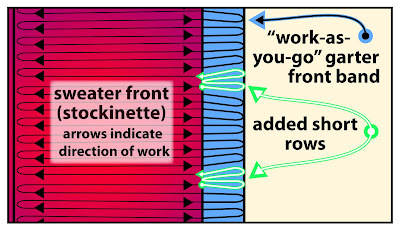 So, for example, for the next step, the crochet hook will form a new loop out of the running yarn--the third loop--and will again pull this loop down, passing in front of ladder 2, through the second golden loop, and down below ladder 3, where it will again be left parked around the hook barrel, while the crochet hook again goes up the outside of the mini tube in search of the running yarn for loop 4. This action will be repeated over and over, each new loop drawn in FRONT of the preceding ladder and THROUGH the preceding loop--the new loop of running yarn therefore going through TWO loops each time--the old gold loop left parked around the hook-barrel and the next green ladder below. At the end of this process, you will have two ends to work in, one at the top, and one at the bottom of each band. However, these are easy to skim into the chain stitches you've made in the mini-tube. All this crocheting eventually forms a continuous chain of stitches which runs lengthwise through the core and along the back face of the mini-tube. In the photo to the left, the stitches of this chain has been picked out in gold highlighting, so that you can see what it looks like in the real world. 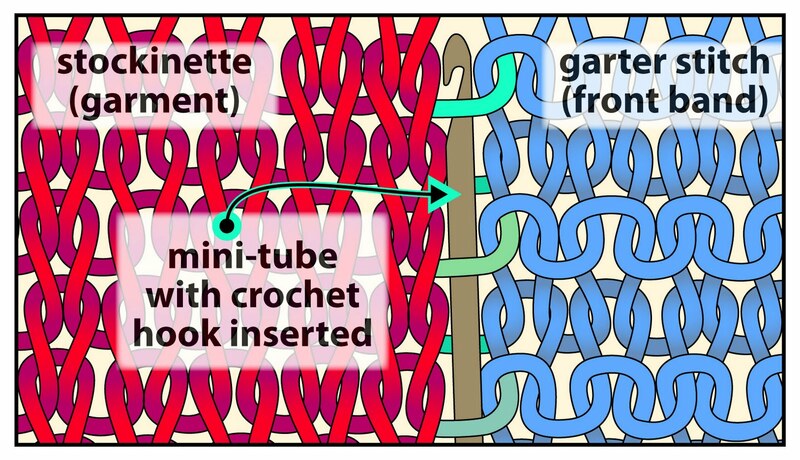 By using your crochet hook to stuff these chain stitches behind and into the core of the mini-tube column, the flip hinge action of that column is pretty much disabled. 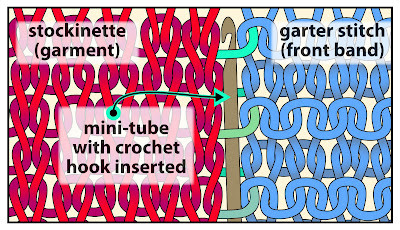 In other words, the golden stitches help prevent the flip action of the mini-tube column and therefore help prevent the bordering garter stitches from flipping back. As mentioned above, this trick really isn't complete until you severely BLOCK the garment--without blocking, the golden stitches simply won't be sufficient to stop the flip. However, with these stitches added, and with the blocking, the garter borders will lay, well... perhaps not perfectly flat, but a LOT flatter with a LOT LESS flipping than without the operation--flat enough to wear the garment open, at any rate, as shown by the opening photo. One final note: where the short rows are, the rhythm of the fabric is disturbed. However, the mini-tube does continue through the disturbance. This is because, as stated above, the band is to be knit full-width, with the wrap going around the first stockinette stitch, not around the last garter stitch. If you poke around with your crochet hook, you will find where the tube continues, even through the disturbance.